Dental floss has been used as the standard confirming tool for checking proximal contact strength in restorative dentistry for centuries. While dental technology is aggressively changing-being constantly improved with modern technological breakthroughs-dental floss is often still the only method dentists depend on, despite its inherent inaccuracy. Floss is available in a variety of sizes on the market, and it is easily twisted on dentists' fingers unknowingly before it is snapped into the contacts. These factors, which make thickness inconsistent, make dental floss unreliable for checking ideal proximal contacts. By using the Gray Final Polishing Strip, which is more dependable, consistent, and accurate, you can more easily determine contact intensity and confirm Interproximal Relief, which is essential when teeth are restored. Fig 1. The ideal proximal contact of an implant-supported crown #19 is adjusted using the ContacEZ Black Diamond Strip prior to cementation, and complete marginal seating is achieved. Fig 3. 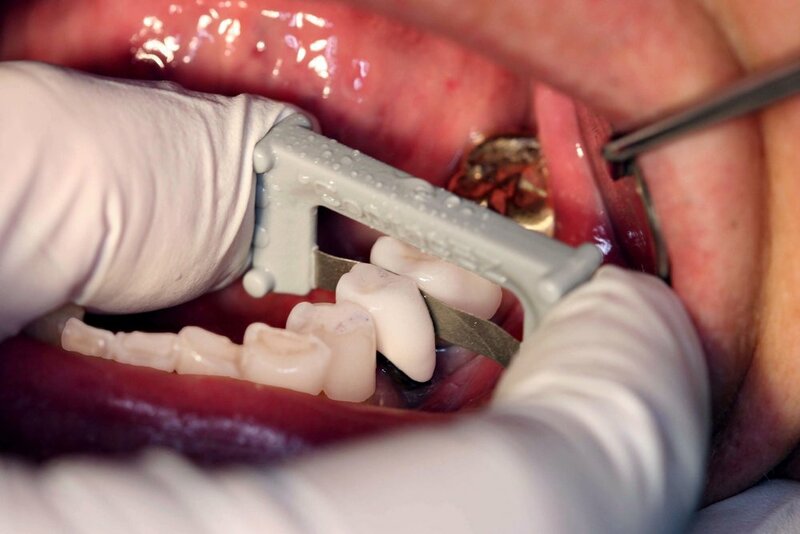 Floss firmly snaps (pops) in and out, but it is not sufficient enough alone to check proximal contact adjustment of a new crown, due to its inconsistency of thickness. Fig 2. Interproximal Relief is confirmed using the Gray Final Polishing Strip after cementation, which passes through the interproximal space with moderate resistance while polishing to a natural finish. The patient feels very comfortable with the new crown, as if it was his own natural tooth.